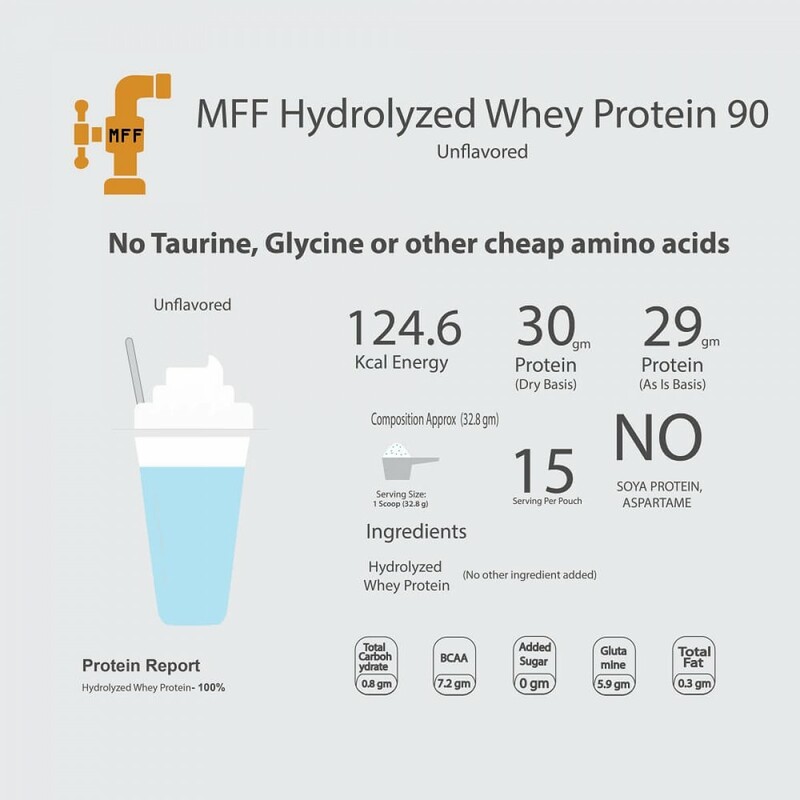 MFF Hydrolyzed whey protein isolate is made from fresh milk with advance partially pre-digested protein properties. In comparison to other protein, Protein hydrolysate goes through the process of breakdown of protein into small peptides. These peptides make this protein very easy to digest and absorb. 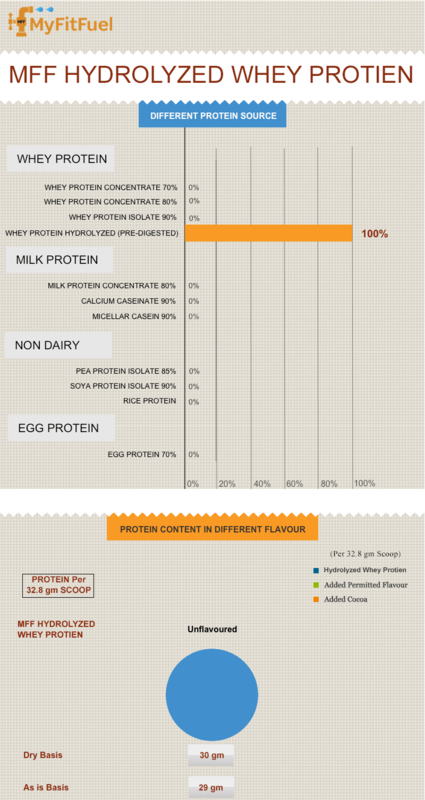 The protein utilization in Hydrolyzed whey protein is highest when compared to other protein sources. This protein helps to increase overall muscle mass of the body. --> Very high protein content in every serving. --> 7.2gm BCAA, 5.9gm Glutamine in every serving in unflavored. --> Protein made from fresh milk where long chain amino acids were broken into small chain (peptides) for fast digestion and absorption. --> Ideal for very quick muscle repair, recovery & growth. --> No artificial color, No Dairy Whiteners, No Skim Milk Powder, No Color, No Soy Protein, No Artificial Flavor and No Preservatives added. Protein that we intake goes through multiple processes before it actually benefits our muscles. Two of the process includes digestion and absorption. First, the protein gets digested and then absorbed in our muscle to actually benefit them. The digestion of the protein is lengthier process due to the long chain of amino acids. In Protein hydrolysate, long chain of all Amino Acids found in the whey protein concentrate and whey protein isolate is broken down into single amino acids. This single amino acid rather than the long chain is very easy to digest and gets absorbed very quickly. This whole process of protein hydrolysate makes this protein as the best Hydrolyzed whey protein isolate powder when compared to other protein sources. 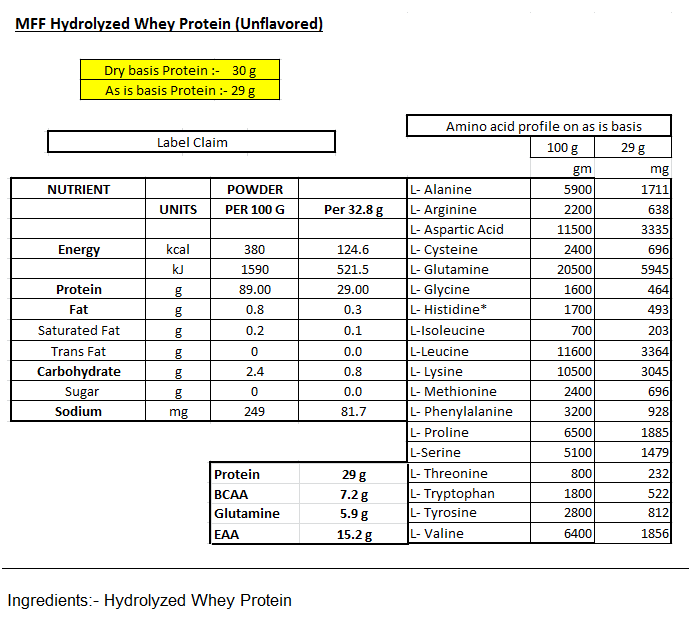 MFF Hydrolyzed whey protein powder provides the complete source of naturally occurring amino acids. When all the essential and non-essential amino acids are naturally present then it makes a complete protein. Every amino acid plays an important role in our body, having protein with complete amino acid profile helps to reduce breakdown, increase repair, recovery, and growth of muscles in our body. 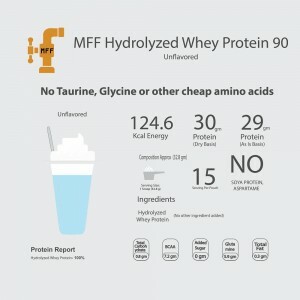 What is the best time to take MFF Hydrolyzed Whey Protein Isolate? --> Early morning during breakfast. --> Or any other time when you are looking to take protein diet. Is Hydrolyzed Whey Protein Isolate litter bitter in taste? And anything i can do of it? Every one have different taste pallet. So only few people might find it slight bitter but many don't. Naturally its little bitter in taste but only unflavored flavor variant. Hydrolyzed Whey Protein Isolate is an advance technology protein where protein is partially pre digested broken into small peptides which make it dense formula with natural fast absorption. But apart from this it provides very high natural benefits of natually ocurring amino acids. More water you add less bitter the protein. So you can add more water to remove that slight natural bitterness (if you feel its slight bitter) or you can make any protein shake or smoothies receipe at home in your kitchen. At MyFitFuel educating customers is always our first and foremost priority. 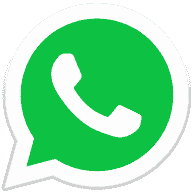 Like in Sports & Fitness Nutrition market in India in 2013, we were the first one to bring 100% Transparency. In 2017, same way for our customers we are the first to bring better education when it comes to the difference between Protein calculations on “Dry basis” vs “As in Basis”. 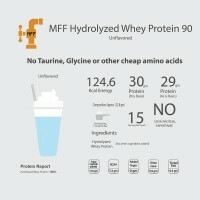 What makes this MyFitFuel product as Best Hydrolyzed Whey Protein Powder in India? a) Quality- That’s always our biggest priority. We never ever compromise in quality of our products and our products quality is what we bet on. b) Consistency - Consistency in the quality is very important for us every single time. We take every measure from beginning to end to provide you the same nutrition quality. MFF Hydrolyzed whey protein isolate powder ingredients are consistently tested to give you the same wonderful results every time. c) Transparency- We believe it’s always your right to learn about the products actual benefits and its worth before you buy best-Hydrolyzed whey protein isolate powder online in India. Many companies never disclose right percentage of protein used in their products, helping them to hide the actual worth and benefits of the product. We always provide complete information in our “Protein Insight” by telling you which protein we use before you buy best Hydrolysate protein powder from us. Our transparency also helps you to always know the price you are paying us is it the right Hydrolyzed protein price. d) Certificate of Analysis- To bring better transparency about our product we back our protein product by Certificate of analysis of the kind of Protein Hydrolysate used to make our product. Pour 300-350ml of water in good blender like MFF™ Blender and add 1 scoop of MFF Hydrolyzed Whey Protein™. Shake it for 15-20 seconds and consume immediately. Use less liquid for stronger and thicker tasting taste. We recommend 1-2 servings daily to complete your protein intake. To promote lean muscles, nutrition expert suggests 1gm of protein per pound body weight every day (2.2g per kg of body weight every day) consumed during the different time of the day. Some train in morning and some in evening but we recommend following important serving times of MFFHydrolyzed Whey Protein. --> Any other time during the day or in between meals as snacks or when you require additional protein intake. Benefits of taking with Water- Taking MFF Hydrolyzed Whey Protein™ with water helps you to get better Lean Muscles and reduces the overall calorie intake from your protein shake. Protein shake in water is also mainly recommended to any individual following the weight loss programme with restricted calories intake. Becuase this is protein have natural properties of fast digesting and absorption, we recommend to take it with water. Benefits of taking with toned or double toned milk- Adding milk with Hydrolyzed Whey Protein powder helps to make the shake creamier and thicker. But 250 ml of toned milk will also add almost 150 extra calories in every shake. So, if you are looking to bulk up or to increase weight then taking a protein shake with milk will always be recommended. Adding milk might make the protein very thick which will take longer to mix. Taking with milk will slow down the digestion of protein in body. Protein is good but need some changes like taste too bitter (Add some flavours), again only 1kg available, previously it was upto 3kg. Mixability good but it turns into foam when making shakes. Pls take a look on it.